New Farmer's Market on Long Island coming in June! Starting on Sunday, the 27th of June, the town of Hicksville, in Nassau County, Long Island, will be offering a farmer's market, featuring Long Island grown fruits, vegetables, flowers, eggs, honey, cheese and bread from 9am until 2pm. 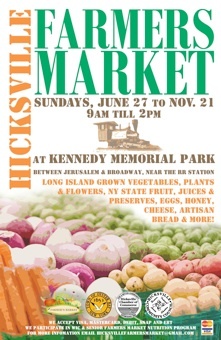 The market is located right near the LIRR Hicksville train station, at Kennedy Memorial Park, between Jerusalem Avenue and Broadway. The market will run throughout the summer and fall, ending on November 21, 2011. The market's website also features some excellent recipes. Check them out here! There is also a second market, in Long Beach, across from the LIRR Long Beach station at City Hall. That market will be offered on Wednesdays from 10am until 6pm and Saturdays from 9am until 2pm. That market begins the 4th of May until the 24th of November. Please support your local farmers and businesses! Vote everyday on what type of community you want to live in with the power of your wallet! !